Well in case you haven’t heard, video blogging (aka vlogging) is the next best thing in the world of social media. Video blogging is a creative way to showcase your brand and reflect your skills. A video blog or video log, sometimes shortened to vlog is a form of blog for which the medium is video. Video blogging became all the rage around 2005. For Last Man Standing fans, you know that Tim Allen’s character on the show maintains a video blog. He uses his video efforts to market Outdoor Man, a fictitious retail store. A well-produced video blog can function as an online resume. This is something that few folks do, yet should. Research shows that video has gained tremendous viewership in recent years. In fact, stats have stated that 55% of people watch videos online every day. We’re seeing this stat in action on Facebook and Twitter. Video content dominates what social network users are consuming on Facebook and Twitter. But what about executive videos? 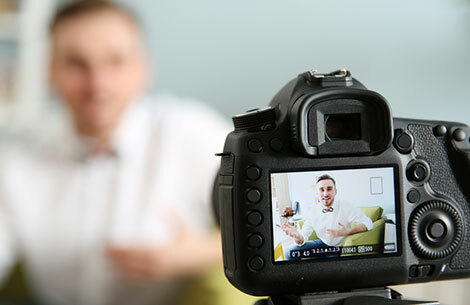 Why should you — a manager or executive — maintain a video blog? First, from the employed professional who wants to help market their current company. Second, from the professional in job search mode who is trying to build an online presence. Below I talk about how to use each when you’re employed versus when you’re in an active job search. Bob Parsons, founder of GoDaddy.com in 2008, turned his blog into a video blog. Bob uses his video blog to draw attention to what’s important. For example, the Bob & Renee Parsons Foundation and his public speaking efforts. Employed: An executive leader doesn’t have to be invisible in corporate media. In fact, a personal touch when video blogging helps consumers see you in a better light. For example, a video blog entry could include you talking about your career journey. Or, something more specific, such as you involvement developing a new product. Job Search: Start by creating your own YouTube channel. Post blog entries as a resource to send recruiters and hiring managers so they can see you in action. You can also upload a small selection of those to your LinkedIn profile. Loic LeMeur, founder of Seesmic (acquired by HootSuite), is a video blogger too. He shares his experiences in his blog and offers great advice on how to build your online career brand. You can check out Loic Le Neur here on YouTube here on YouTube. Employed: Start building your personal brand now – thinking about “forward facing” your career. Create blog entries that speak to your current company’s brand. When employed, be all about **their** products and services. But, also create separate video blogs that show your contributions to the company. These may be useful now or kept for future use during your next job transition. Job Search: Share your knowledge. Cover topics specific to **your** professional career brand. Outline issues and solutions you’ve implemented, assuming you’re not under a confidentiality agreement. Remember to speak to your strengths and your expertise in the industry or specific area. If you haven’t heard of Blendtec, you’re about to. Blendtec is best known for destroying phones and other devices with its blender. Employed: A video blog gives you a venue to showcase what your product can do. Demonstrations are powerful. Video blogs can be entertaining. Yet, keep in mind the main goal: to learn about the company and products, which leads to sales. Job Search: Want to impress recruiters/hiring managers with your video skills? Video blogging can do that for you. Nice added benefit, right? Your video blog doesn’t have to be flashy or laugh-out-loud entertaining to be a successful tool. A series of brief (1 to 3 minute) videos that address the topics you want to focus on are perfect. Check out James White, CEO of IntouchCRM. His blog talks to his team about the importance of teamwork: Jim White. Employed: Using a video blog to train and motivate your team is ideal. Not only do you share your knowledge, you create a resource to show to new employees. Job Search: Have a proven 4-point marketing plan that you created? Or, something else just as fabulous? You could create a series of how -to blog posts that address each of these points. Think of your unique value to an organization and highlight them in video blogs. The possibilities are endless.